A Stitcher’s Garden is located in an historic barn along the old Erie Canal in Central New York State. The ambiance of the old beams, picturesque views, amazing selection, and convenient location make this a destination needlework shop. 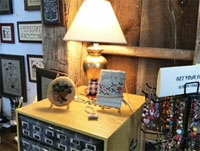 The shop features charts by well known cross stitch designers to choose from. In addition to cross stitch, you will find Punch Needle, Knotwork, Silk Gauze, Wool Appliqué, Counted Canvaswork, and more. We carry hand-dyed fabrics and fibers from Weeks Dye Works, R&R, The Gentle Art, Picture This Plus, Classic Colorworks, etc. There are linens from Zweigart, silk from Needlepoint Silk, Perle Cotton from DMC, and many others to choose from. 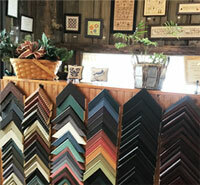 The shop offers Custom Framing as well as pre-made frames. There are Tools & Embellishments, Q-Snaps, Needle Magnets, Magnifiers & Lighting, plus Wool, Ribbon, and Trims for finishing. Among the events we hold are Trunk Shows, Stitch-Ins, an Annual Needlework Exhibit, Retreats, Market Parties, and there are lots of Shop Models to inspire you. Our friendly, helpful, knowledgeable staff are there to assist you in achieving the best of stitching experiences! Copyright © 2002–2019. All rights reserved by A Stitcher’s Garden.